This version of HSGI's battle proven tactical belt utilizes the proven 1.5" Cobra buckle on a 1.5” web. The belt is constructed to the same standards as HSGI's 1.75” Cobra belt, but is designed for those who need a belt for daily wear around the office or out in the field. This belt's excellent stiffness and rigidity will not allow the weight of holsters and mag pouches to “roll” the belt. 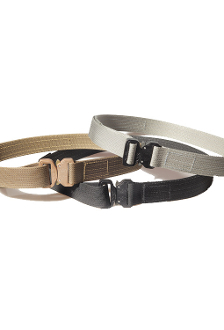 The 1.5" width allows this belt to be easily used on both standard and tactical pants.